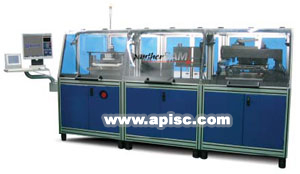 The Sonikon™ PANTHER-SAM is an automated production system consisting of a Loading / Unloading Station,Scanning Station and a Dry & Sort Station. The system allows the user not only to run a fully automated scanning mode, but to manually load the devices and use the software application to complete the scanning manually. The load and unload module of the PANTHER-SAM consists of 2 stackers, where JEDEC trays are loaded and unloaded. The trays will be picked up and brought to the Scanning Station for scans. The sorting station consists of a pick and place system and an unload stacker. The pick and place system picks up defective devices based on the scanning results and sorts them accordingly. 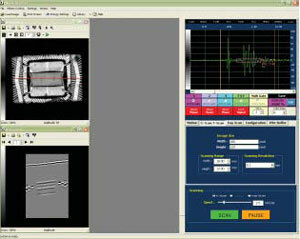 •Real time digital oscilloscope with gates. color outlines or full color. •Cutting tool - 3D cross sectioning. •3D Zoom In / Out. •15MHz, 25MHz and 75MHz Transducer. Transducers are available - Optical. Enhanced Non-Destructive Testing methodology for signal purity offering superior image analysis resulting in guaranteed quality assurance. of up to 6 Layer Stack Dies or more. •Eliminates high & low frequency noise and distorted signal. Offering The Best for signal purity! Available with all Sonikon™ SMA System, the QSonik™ Analysis is a powerful tool for analyzing scanned 2D Images, with functions ready for image enhancements, ture measurements, annotations, etc. and a report generator. Available with all Sonikon SAM Systems! Detect defects more effectively with the Multi-Gates Scan method. 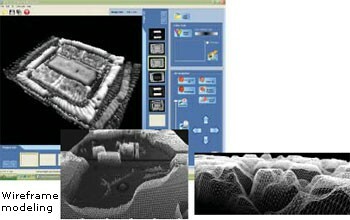 With the ability to scan within layers (up to 6 Layers Stack Dies or more!) of ICs, Flip Chips,BGAs, OFPs, SOTs, etc. accurately ,defects are no longer hidden and are exposed visually. Delamination,volds, cracks and many other hidden defects can be easily isolated. Standard Scanning Acoustic Microscopy System with all the superb performance of Sonikon Scanning functions include the Multiple B-Scan freture. 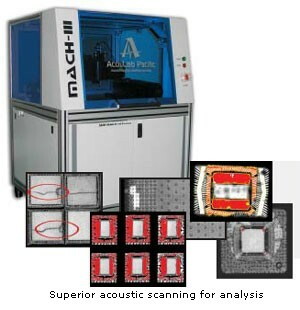 Perform unlimited cut sectional to your C-Scan outputs to define and complete your analysis and inspection. Color scales are available to better differentiate your scanned images. - Micro Hair Line cracks. The Sonikon MASTER offers a large 24"x24" scan area for flexibility of space. 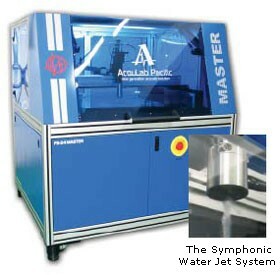 The system incorporates Sonikon's Symphonic Water Jet System, a non-immersion scan solution that supports all transducer ranges. Large sized devices or those that are moisture-sensitive will benefit from this frature. A filtered water reservoir is also included to control and automate water flow and consistency in the scanning tank and the Symphonic Water Jet System. 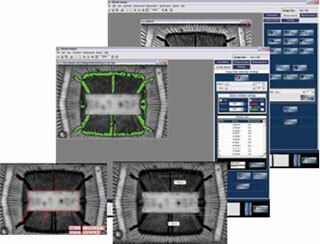 The FS-24 MASTER is capable of performing all Scan methods (C-Scan, B-Scan, etx.) including the optional Through-Scan. Fixture for the receiver-transducer is available.